In a groundbreaking effort to systematically study and compare success rates of violent and nonviolent social-change movements, Erica Chenoweth and Maria J. Stephan carefully researched 323 social-change campaigns from 1900 to 2006. Chenoweth and Stephan’s astonishing finding is that campaigns of nonviolent resistance are nearly twice as likely to succeed as violent uprisings. 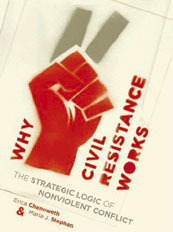 In their book, Why Civil Resistance Works: The Strategic Logic of Nonviolent Conflict, the authors found that far greater numbers of people from more diverse parts of society joined nonviolent campaigns than violent ones. This greater level of participation translates into more people who can demonstrate for change, and withdraw their cooperation from an unjust regime. In addition, Chenoweth and Stephan found that when nonviolent movements overthrow an unjust regime, the victorious resistance groups are far more likely to establish democracies and protect human rights, and far less likely to lapse into civil war than their violent counterparts. Their innovative research may be making heads spin in the circles of international security studies and military analysts, but it was also a dramatic surprise to one of the authors, Erica Chenoweth. Chenoweth had never fully paid attention to such arcane subjects as nonviolent movements or “people power.” She was more well-versed in its diametric opposite — the uses of military power. Stephan, on the other hand, was an expert in the study of nonviolent movements as an educational coordinator for the International Center on Nonviolent Conflict. She was teaching a workshop called “People Power and Pedagogy” to introduce the topic of nonviolent resistance to scholars in the field of security studies. When Stephan discussed cases in the Philippines and Serbia where nonviolent resistance had achieved what years of armed uprising had been unable to accomplish, Chenoweth expressed such strong skepticism about nonviolent movements that people suggested she do a systematic comparison of the two kinds of struggles. So Chenoweth and Stephan joined together to compare the effectiveness of hundreds of nonviolent and violent resistance campaigns. The two scholars made an odd couple, given their widely divergent belief systems. Chenoweth had spent four years getting her Ph.D. in terrorism studies and had come to believe that armed insurgency only happens because people found it is the best way to achieve their aims. Yet, she found that researching hundreds of movements completely challenged what she now calls her “typical, structure-based, politically biased assumptions” about the greater effectiveness of armed struggles. “I did the research and I’m shocked,” she said. Perhaps the most extraordinary testimony to the deeply insightful — almost clairvoyant — conclusions of the authors is that they completed their book before the grass-roots rebellions of the Arab Spring toppled one dictator after another. That seemed beyond imagining when this book was written, yet the people power movements that arose in the Arab Spring seem to be irrefutable vindication of the authors’ analysis of nonviolent insurrections. Their research had convinced them that nonviolent resistance was “perfectly viable as a strategy for removing authoritarian regimes and achieving self-determination almost anywhere in the world.” Nevertheless, they still could not have expected the lightning-fast wave of nonviolent movements that toppled authoritarian regimes in the Middle East in the first months of 2011. The events of the Arab Spring certainly seem to justify nearly all of the hopes raised by the two women’s momentous study of nonviolent movements. The word Zeitgeist is translated as “the spirit of the times.” At certain providential moments, it becomes possible to see the spirit of the times flow through the massive movements in Egypt and Tunisia. The same spirit seems to be on the march in the Occupy movements in Oakland, San Francisco and New York City. The same spirit of the times also seems present in the scrupulous research of two highly original scholars who had the audacity to challenge generations of military analysis and security studies. In doing so, they have given us all the gift of new hope in the power of the people. As I interviewed Erica Chenoweth about her research into social-change movements, her insights leaped out with great clarity, enthusiasm and intensity. Street Spirit: Your book, Why Civil Resistance Works, analyzes an enormous number of campaigns seeking to change society, both violently and nonviolently — 323 campaigns in all. Is this one of the most comprehensive studies of social change movements that you know of? Erica Chenoweth: Yes, to my knowledge this is the most comprehensive in terms of the global coverage and the time period covered. 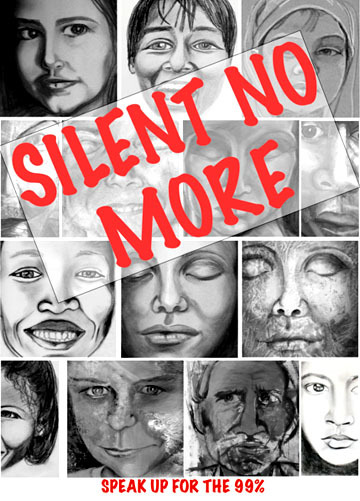 There is another project at Swarthmore College now that’s led by George Lakey called the Global Nonviolent Action Database, and that’s an online portal where activists can go and look at nonviolent campaigns that have existed over the past 500-plus years. Lakey has collected data on those campaigns, what happened, what they were about, and his data have far more reach because he covers everything from Sri Lankan veterinarians striking to get better conditions for elephants, to things like anti-dictator campaigns of the type that Maria Stephan and I analyzed. Spirit: This is such a small world — tomorrow I’m interviewing George Lakey on the issues of nonviolence. In the 323 campaigns you studied all over the world, what did you find about the relative success of violent versus nonviolent efforts? Chenoweth: We found that during the period of 1900 to 2006, nonviolent resistance campaigns are about twice as effective as violent ones in achieving their immediate goals of either regime change or territorial change. We also found that these trends hold even under conditions where most people expect nonviolent resistance to be ineffective. Nonviolent campaigns were effective, for instance, against dictatorships; against highly repressive regimes that are using violent and brutal repression against the movements; and also in places where people would expect a nonviolent campaign to be impossible to even emerge in the first place — such as very closed societies with no civil society organization to speak of prior to the onset of the campaign. Spirit: That’s what I found so groundbreaking about your research. Many people feel that nonviolent resistance can’t succeed against a dictator who will resort to scorched-earth tactics and genocide. You set out on the very difficult task of investigating whether nonviolent campaigns can actually overthrow militaristic regimes and dictatorships. What led you to take on such a difficult investigation? Chenoweth: We did it precisely because of the skepticism that a lot of people have about the efficacy of nonviolence in these circumstances. In most of the violent insurgencies we look at, people will say the reason they are violent is because nonviolent resistance can’t work in these conditions. So this is why it’s particularly striking that even in these types of conflicts, we’re seeing nonviolence resistance outperform so dramatically. Spirit: One explanation you arrive at for the greater success of nonviolent movements is that they have “a participation advantage” over violent campaigns. How does that contribute to their success? Chenoweth: Yes, we find that the average nonviolent campaign is something like four times larger than the average violent campaign, and, in general, we can see in our data that the nonviolent campaigns are far superior at eliciting active participation. Now, sometimes you will see armed campaigns that have what you might call passive support by the society. You know, they might have some insurgents hiding in the backyard when the police come and ask if there are insurgents in the backyard, and people say no. But in the actual prosecution of the conflict, you see civilians in armed conflicts mostly just trying to stay out of the way, stay out of the crossfire. Whereas, with nonviolent campaigns, unarmed civilians are the actual active agents of the conflict. They’re prosecuting the conflict themselves and we see that this activates a number of points of leverage that are already in the society because no regime is a monolith that exists in isolation from the people that it rules. Spirit: It depends on the cooperation of people in many sectors of society. Chenoweth: Exactly. Exactly, and that’s why people can participate by removing their assent. Spirit: And since nonviolent campaigns tend to have higher degrees of civilian participation, there are more areas where people can remove their cooperation as an act of resistance? Chenoweth: That’s right, and in particular when this happens in key pillars of support — like among the economic elite, or business elites or security forces — usually this is the mechanism by which nonviolent campaigns succeed. So they’re not winning just because they’re creating a moral dilemma for the opponent. Most of these campaigns occur in such extreme conditions, that dictators would be happy to launch scorched-earth campaigns and indeed have tried to do so. But just because they want to do so, that doesn’t mean they’re capable of doing it, because they rely on the obedience of a number of pillars of support in order to carry out those types of orders. And what we find with massive, sustained participation in a nonviolent campaign is that most dictators find it extremely difficult to indefinitely maintain the obedience of their security forces, in particular. Spirit: You found that not only are nonviolent campaigns twice as likely to be successful, but they are more likely to leave in their wake democratic societies and are less likely to relapse into civil war. Why is that true? Chenoweth: We find that nonviolent campaigns tend to be followed by more democratic governments and they also tend to be associated with a lower probability of civil war relapse. Maria Stephan and I speculate that this is because of the actual practice of nonviolently building civil society from the ground up in the most active way possible. One thing that many of us know from democratization research is that an active civil society really enhances the responsiveness of the government to its people. So the key thing with democracy is establishing these norms of consent. When civil resistance campaigns prevail, they tend to enshrine norms of consent. Whereas, with an armed struggle, the norms that are being generated during the campaign generally tend to be more martial values. So when armed campaigns win, usually if they win by the sword, they rule by the sword. There’s no real incentive to give up their arms. So you end up with a much more tense scene where there are multiple, different armed groups in the society vying for control. These types of conditions are not very amenable to either democratic consolidation or durable peace. Spirit: It’s almost a lesson in karma about being careful how you build a movement. If you build a democratic movement with lots of people participating, that’s the legacy you’re leaving for your society’s future. If secretive bands of armed insurgents take over, then, as you said, they’re going to rule by the sword. Chenoweth: Yes. I think it obviously depends on what the movement intends to do — or what their visions of the society is that they’re trying to create. You know, some movements don’t have a democratic vision of the society they’re trying to create. In our research, we try to suspend that judgment about what the goals of the movements are and instead just try to focus on whether they succeed or fail and then what the outcomes are. But I think in some ways what we’re showing is that method matters more than ideology. Spirit: The method of a movement matters more than its ideology? What do you mean by that? I think of Gandhi, who said the ends don’t justify the means, so movements must be very conscientious about the means used to change society. So, for example, Lech Walesa came to power when the Solidarity movement succeeded in Poland. Once he became the president, he experienced more protests and more strikes after his ascendancy than the Solidarity movement had before the Communists fell. Spirit: People kept organizing because they didn’t want Walesa to be tyrannical. Chenoweth: It was basically the Polish people saying, “We want to see you tie your own hands and not turn into a tyrant.” No person is above the temptations of power, so we’re going to take responsibility in our society for making sure you don’t succumb to those temptations. But imagine if Lech Walesa had come to power with an armed insurgency. Well then, the temptation would simply be to wipe out all of the opponents who were standing in the way and who might also launch a subsequent armed uprising to overthrow him. So yeah, I think it matters how you fight, I think how you fight determines in large part how you ‘re going to rule when you win. Spirit: Under what conditions are nonviolent campaigns most likely to succeed and when are they most likely to fail? Did you discover any general patterns here? Chenoweth: In terms of when nonviolent movements fail, we do find that when they fail to achieve mass participation, they’re basically unlikely to succeed. So I’m looking more at why some movements fail to achieve mass participation. I can think of three sorts of things that they should look for if they feel their mobilization is faltering. The first is message. Spirit: The message of the movement? Chenoweth: Yes, the message. So, basically, do we have a grievance that’s widely shared in this society, that’s resonating with ordinary people? The second thing is method. Are the actual tactics that we’re selecting demonstrating our credibility with the movement and our staying power and our viability? And the third thing is timing You know, I think a lot of movements think that they can just kind of create interest where there isn’t a lot of interest there [laughs]. And sometimes, it’s not generating interest because the timing isn’t quite right. Spirit: Can you go back to your second point and explain a little more what you mean about the method of a movement? Chenoweth: We must ask if the methods that we’re using — in terms of the tactics, demonstrations, strikes, boycotts, these sorts of things — are they communicating to wider audiences that we’re credible and viable? One of the debates going on right now in the Occupy movement is whether the black bloc is helping the movement or hurting the movement. I think that a more interesting question isn’t whether it’s helping or hurting the movement per se, but whether it’s attracting participation from ordinary people or whether it’s reducing participation from ordinary people. Any type of method should be measured against this: Is this increasing our mobilization potential or decreasing it? And the more diverse the participation, the better. Generally, movements do well when they have a very diverse representation among their participants. So this means people, just ordinary families, it’s elderly, it’s youth, it’s children, it’s all kinds of races and classes and also different political backgrounds. So if there’s a certain type of method that seems to be identified with only a very narrow part of the movement, that usually makes people feel like it’s exclusive in some way. Spirit: You found that even the success of violent campaigns depends on receiving mass popular support and that’s especially essential in nonviolent campaigns. When Occupy first began, there was such widespread support based on this great sense that Occupy was really carrying a message that many people were feeling about economic inequality. What can the Occupy movement do to increase that level of support and what are the danger signs of alienating public support? Chenoweth: The recent research, not my research per se, but some research coming out on social movements, shows that every participant in a campaign has a risk and gain calculation. So they think about how much risk am I willing to assume toward this end. The second thing is how viable is the campaign that I’m considering joining — is it going to succeed or fail? This is just the plain old human idea that we all want to put our money behind the winning horse. So there are a couple of things that I think can be done. 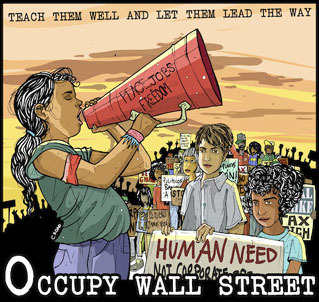 I think articulating to people that the Occupy movement is a nonviolent movement is very critical. Spirit: Why is it crucial? Chenoweth: Because I think that people don’t want to be associated with something that isn’t nonviolent. Now, that’s a generalization and it’s not going to apply to everybody, but I know a lot of people, actually personally, who participated in Occupy Oakland actions at the beginning of the campaign — at the Port of Oakland shutdown — who don’t want to be identified with it anymore because of what they see as its indiscipline. You can debate and you can theorize about whether it’s justified to engage in more property destruction or intimidation or things like this. You can have debates about that, but the fact is it reduces participation, and participation is the one thing that the movement needs more than anything else, I mean it’s an actual necessary prerequisite to the success of the campaign to obtain broad-based participation. 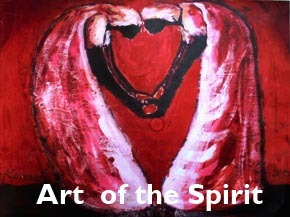 Spirit: What else do you see happening with Occupy? Chenoweth: Okay, the second thing is that I think there is an interesting problem in the campaign, which is the lack of structure. I understand that the lack of structure often serves a strategic purpose, which is that it casts a wide net. People can participate as they see fit and in more of an ad hoc way, and it also has an ideological reason for a lot of people. A lot of people think that having a more leaderless organization is a vision of the type of society they want to see in the world, so they want the movement to represent that. But there should also be a recognition of the strategic limitations of this type of organization. I think what we’re seeing a lot with the Occupy movement is the fallout, the strategic fallout of having no real organization and leadership. Spirit: What strategic fall out are you talking about? Chenoweth: I’d call it a lack of overall strategic vision and a lack of expressing the particular goals that the movement wants to see met. For instance, when would the movement be satisfied? What is actually the end game that all of the movements can agree to? Not all of the different Occupy movements have to agree on all of the different things, you know, but I think they should at least be able to articulate a 10-point expression of what they all do agree about. But the other thing is just the indiscipline in the movement with regards to methods. 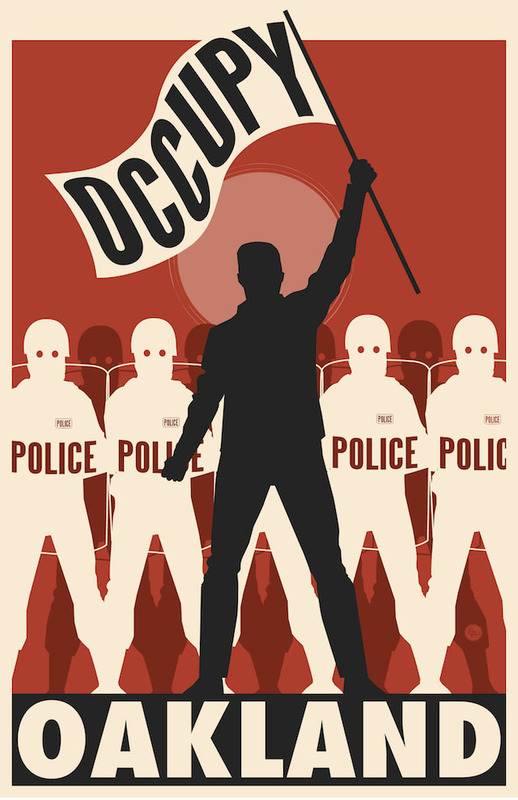 So what’s going to happen with Occupy is that I think the campaign is just going to start eating itself. Spirit: What do you mean by that? The second thing is that we must say, these are the things that we want. And you provide a body with whom the other side can have a conversation. The third thing is that having leadership allows for planning — like actual, collective planning and coordination. So, ironically, the ideology that’s expressed in the Occupy movement is completely at odds with the type of organizational structure that tends to succeed in other nonviolent campaigns. It’s important to have a distinct, unified leadership that represents the movement. It doesn’t have to be a charismatic leader. It just needs to be a board or a council of people that are the legitimate voices that speak for the movement. Spirit: Your research shows that there are fewer physical barriers to taking part in nonviolent campaigns, in part because participation in nonviolent resistance doesn’t generally require physical strength or agility or youth. So, participation is open to families, women with children, elderly people and disabled people. But participation in violent resistance is often physically prohibitive to those groups. Some Occupy activists have made the point that tactics like street fighting, throwing rocks and running inevitably exclude people we don’t want to exclude in a democratic movement. So, when you studied the barriers to participation to violent campaigns, does that have a corollary with the Occupy movement? Chenoweth: Yes. Actually, it’s the very first thing I thought of when I started seeing the street fighting going on. I thought, well, this basically is going to be the end of participation of most of the people the movement needs to succeed. In fact, I think it is a mistake to think that youth should be at the vanguard of any revolutionary movement. That’s basically a recipe for indiscipline — and I am one, I’m a youth [laughs]. So I know exactly what the young pulse is and I know the resistance to taking direction from older people. You feel like they’re saying: “Well I’ve been there, I’ve done it and here’s what we’re going to do.” But the truth is that revolutions win because the elderly are on board, not just because the youth are on board. Spirit: Many people feel that young people are crucial to social-change movements. Can you be more specific about why you feel it’s a mistake to look at youth as the vanguard? Chenoweth: I think the problem is impatience. There’s the sense that if we haven’t won in six months, we have to escalate and take it to the next level. But the truth is that the average nonviolent campaign, in our data set at least, takes three years to run its course. So if the campaign hasn’t been using concerted, well-thought-out, well-executed civil resistance for three years to no effect there’s really no justification yet for any type of escalation to any type of other methods. And even at the three-year point, it doesn’t necessarily mean that you run out of Gene Sharp’s 198 potential methods you could be using [laughs]. Sometimes it just means a strategic redirection of nonviolent methods. There is a sense that the energy and the enthusiasm is most welcome, but not when taken to extremes. What most revolutions really need is calm, thoughtful, patient planning about 95 percent of the time, and five percent of the time, the actions — which are what the youth are so attracted to. Spirit: Didn’t your research also show that the secrecy and clandestine methods needed in violent campaigns can prevent many people from joining? Chenoweth: Yes, the clandestine nature of armed struggles really limits their communication potential. What I mean by that, is that they have a hard time demonstrating to the general public that they are many in number and that they are viable. And the only way that they tend to demonstrate that is either through propaganda — and everyone knows they are over-representing their size when they’re doing propaganda — or through armed actions themselves. When you are relying on armed actions to carry a message for you, there is a really good chance that that message is going to get distorted. It’s not because there is some kind of a huge conspiracy by the mainstream media to distort your message, it’s actually a psychological phenomenon that when human beings as animals see violence they try to avoid it. So our brains tell us when we see some sort of violence or when we see destruction, that it’s a threat to me. Even if we sympathize or agree with it, we generally stay away from conditions or situations that look like they could be physically threatening to a person. So whenever you have to rely exclusively on violent tactics to get your message across, there is a really good chance that people will misinterpret what you’re about. Spirit: If a movement is open and transparent, that may reassure its members, but doesn’t openly communicating about actions run the risk of police repression? Chenoweth: In the United States, it is not illegal to organize nonviolent action and so there is nothing illegal about communicating about these actions publicly, although you may always run the risk of repression. But there are many things that can be done to prepare a movement to mobilize and to continue building its mobilization even when it is being repressed. I think the civil rights campaign is a great example where activists were taking the time to be trained in how not to react — how not to use violence, even when violence is being used against you. If you want people to participate, you have to give them the skills to participate and be successful, and to build the viability of the movement. That’s what those types of trainings are about. Spirit: Many skeptics question whether nonviolent resistance can work against dictatorships, and heavily armed, authoritarian regimes. Did your research turn up examples of nonviolent movements that successfully challenged really brutal regimes? Chenoweth: I think Iran is one of the best examples we have because, you know, I often hear people say nobody has had it as bad as the Syrians today in terms of facing a brutal dictator who will stop at nothing to crush the movement. The Iranians, during the Iranian revolution in 1978 and ‘79, were being killed at a much faster rate than Syrians now. Probably between 3,000 and 10,000 people were killed in less than 100 days by the Shah’s security forces. Yet they were still able, through nonviolent discipline, to basically make the security forces stop doing that and defect to the other side. This was a totally brutal regime. The Shah of Iran’s regime had spent the previous few decades basically rounding up armed groups that were Marxist or certain types of other opposition factions and summarily executing them — hanging them in public and everything. So this is a very brutal regime and the thing with that level of brutality, is that you really hate it, you know? And in order to get huge numbers of people to participate in a movement, the opponent has to be truly hated. There has to be a shared sense of grievance, and I feel like the same thing was true for Mubarak. [Hosni Mubarak was the president of Egypt from 1981 until he was overthrown in February 2011.] Everybody knew somebody who had been arrested and tortured in Mubarak’s prison. Everybody could relate to the injustice and the indignities of that regime, and so when the time came where it looked like this is the real deal and people were going to show up and start participating, millions of Egyptians showed up. And in Iran during the Iranian revolution, 10 percent of the Iranian population participated in that revolution. It was probably the largest one in history. Spirit: I think many people will be surprised to read your book and find that nonviolent resistance has worked even in countries that were essentially police states ruled by strong-armed dictators. Chenoweth: You know, one thing that’s interesting is that John F. Kennedy said this thing that lots of people like to quote about nonviolent resistance. He said, “Those who make nonviolent resistance impossible make armed revolution inevitable.” But actually, what our research shows is that nonviolent resistance is almost never impossible. You can’t make it impossible. And armed uprisings are never inevitable. Instead of being something that people automatically choose because they’re forced to by their circumstances, I’m becoming more convinced that it’s something people literally choose. They choose it because they don’t know that there is a realistic alternative. So what I’m hoping to do is change this huge misconception about nonviolent resistance. I don’t have a dog in the fight, ideologically. I’m not a pacifist or whatever. I certainly wasn’t one when I started the project and I’m not one now. But I definitely think that there is this huge misconception that nonviolent resistance and armed resistance are just substitutes for each other and when nonviolence doesn’t work, people just use armed resistance and that’s the natural outcome. More and more, I’m convinced that people actually are making choices and a lot of times it’s a really bad choice to use armed resistance. Spirit: It is fascinating to learn that you are not a nonviolent activist trying to prove your point. Instead, didn’t you kind of wander in from this other area of research into international security? Chenoweth: I was a fellow at Harvard actually, when I started this study in the international security program. I was very interested in the breakup of the former Yugoslavia and all of the ethnic conflicts that were emerging in Eastern Europe and Africa. So I was very keyed into civil war stuff and then when the embassy bombings happened in 1998, I got very interested in international terrorism. Part of the Bush administration policy in the early 2000s was to promote democracy as a way to reduce terrorist violence. I was very interested in whether democracy promotion had actually reduced terrorism in the past, so I wrote my doctoral dissertation on this topic of whether terrorism is actually less common in democracies than it is in authoritarian regimes. Instead, I found that’s it’s basically just as common, if not more common, in democracies [laughs] than in authoritarian regimes. So, that was what I was studying when I went to this workshop that Maria Stephan was putting on about people power and nonviolent resistance. So I would call myself a traditional guns-and-bombs scholar, following the tradition of people like Tom Schelling, you know? Spirit: So, in conducting this research, you didn’t come in with the mindset that nonviolent resistance was going to prove more successful? You came in with the assumptions that a “traditional guns-and-bombs scholar” would have? Chenoweth: Well, I can remember being very surprised when I finished collecting the data and just ran the primary results, trying to look at the success rates and see not only that nonviolent resistance was more successful, but twice as successful as armed insurgency. That was absolutely shocking to me and I felt like, wow, we have really been missing something important in international relations and this is going to be a really big deal. I remember thinking that when we publish this, it’s going to be a big deal. Spirit: It’s absolutely a big deal. It’s an audacious claim, except it’s not a claim — it’s a matter of what your research turned up. Chenoweth: Right. And after I thought this is going to be a big deal, the second thing I thought was, this is going to be really controversial. You might notice in the book that kind of every statement has a caveat where we [laughs] try to anticipate what the counter-argument is and then try to just deal with it right then. You can read between the lines and see that we were just preparing ourselves for the controversy. Spirit: You must have braced yourself to have your arguments shot down all over the place. But has it proven to be as controversial as you suspected? Chenoweth: A couple interesting things that have happened is that I’ve gotten way more push-back about this idea than with any of my stuff on terrorism or insurgency. That’s very interesting, because people just don’t want to believe that nonviolent resistance works. I don’t know why they don’t want to believe that, but they don’t. It’s strange and it’s been very illuminating, because it indicates to me why it’s so hard to convince people to stop using violence. It’s not that they think it works, it’s just that they’ve got some kind of commitment to it. Spirit: What kind of commitment? Chenoweth: I don’t know if it’s an ideological commitment to it, or a psychological commitment. I don’t know what the commitment is to it, but there seems to be one. So this has provoked way more visceral push-back than any of my previous work on violence. The second thing is that, for the fist time ever, I’ve actually felt somewhat threatened because of my research. Sometimes when I travel and do presentations abroad, for instance, I don’t feel 100 percent safe. I don’t actually want to go into any more detail than that, but it’s brought up a host of new considerations about safety. For some reason, people think that I’m out there trying to provoke revolution, which I’m not. So for the first time in the past few months or past year, I’ve actually started to feel a little nervous when I’m out and about. Spirit: Well, I can understand that. Activists involved in resistance movements feel that too. And you’ve become very prominent now. In a sense, your study is subversive — in the very best sense. It’s subversive intellectually and it makes people reconsider the paradigm. But it’s also subversive in that if it’s taken seriously, it gives the common people all around the world a greater belief in people’s power. Chenoweth: Right. One thing that I will say, though, is that what I think that our work does is, that when people are already using nonviolent resistance and they’re starting to feel afraid or discouraged about using it, it seems to help them be less afraid. Spirit: That’s just incredibly important. Chenoweth: Yeah, and I’m always in favor of people feeling less afraid. That doesn’t mean that they should feel encouraged to go do silly things or unsafe things. But just the sort of knowledge that, wow, there are hundreds of campaigns that millions of people all over the world have done or are doing, and they were okay. It’s pretty important for people in very closed societies to know that information. Spirit: That’s beautiful. That’s almost the heart and soul of why we teach people about nonviolent movements. I mean, that wasn’t your intention in researching this area, and yet the outcome is that your book does give people hope, does it not? Chenoweth: Yes, I think so. Spirit: Speaking of an area where people need hope, one of the cases you study in your book involves the Palestininan’s use of nonviolent resistance. Chenoweth: Yeah, so the Palestinian case, I think, is a great example of how nonviolent resistance is the best hope of Palestinians to achieve durable self-determination. We found that they achieved more during the first Intifada, the nonviolent phase of the first Intifada, than they’ve ever achieved before or since then. The problem with the end stages of the first Intifada is that it devolved into infighting and violent conflict, which did undermine their overall aim. It’s a great example of how sometimes armed actions might lead to what I might call process goals where they bring attention to the movement, but don’t bring necessarily bring success, ultimate success, to the movement. Newspeople turn their cameras onto things when they blow up, but that doesn’t mean that it advances the overall strategic aim. So I think the big lessons from that movement are that the lack of unity within the movement and devolution into armed infighting, and then fighting against the Israelis using arms, really undermined what really was a promising nonviolent movement. Spirit: You looked at the uprising in Burma from 1988-1990 as a way of understanding how nonviolent resistance sometimes fails. Chenoweth: In the Burmese case, the two big takeaways there are, first of all, an over-reliance on what I would call “methods of concentration.” So Gene Sharp makes the distinction between “methods of dispersion” [which involve such tactics as consumer boycotts, strikes, stay-aways and go-slow actions at the workplace] and “methods of concentration” where you do demonstrations and rallies and occupations and things like that, which are very high-risk. They’re very disruptive and get a lot of attention, but they’re very high-risk and make people very vulnerable to repression. Spirit: Because of the violence of the Burmese regime? Chenoweth: Exactly, and so there were some general strikes that happened during the 1998 revolution attempt, but they weren’t sustained. The other big lesson that comes out of Burma is the over-reliance on a single figurehead. So Aung San Suu Kyi totally deserves the Nobel Prize, but she also made some strategic mistakes. One of them was that she insisted to the movement that it not attempt to divide the military. The reason is, because her father was the creator of the Burmese National Army and that’s where she got her legitimacy. So she didn’t want to try to divide the security forces and encourage defections, and that was a huge mistake. People within the movement also wanted to do that, but had to sort of defer to her as the figurehead and, as soon as the movement was decapitated when she was put under house arrest, the movement fell into complete disarray. So it’s a good cautionary tale. Having a single leader can sometimes make a movement cohesive or coherent, but it can also mean that you are putting all your eggs in one basket and as soon as the person makes a bad mistake or is taken away, the movement is completely in disarray. Spirit: Your book includes a detailed study of the people power movement in the Philippines that overthrew Ferdinand Marcos, a brutal dictator supported by the United States. His regime also had a huge military to back it up, yet he was cast out in a remarkably short amount of time. Chenoweth: Yes, exactly, and he had also fought off numerous domestic insurgencies, some of which had some real momentum behind them — a communist insurgency and the Islamist insurgency in Moro. But then a nonviolent movement came along and did what none of those other armed groups could do because it was able to do exactly what its name is — people power. The Philippines is such a great example of the great potential of nonviolent resistance. The church was involved, and labor unions. Ultimately, the military made a calculation that it could not indefinitely repress this movement and so I think it’s one of the classic examples of the broad-based participation where pretty much everybody in that society was represented in that people power movement. And they assumed many risks. It wasn’t one of those cases where, when they went out to the streets, they thought there was no way Marcos would repress them. They expected repression and many of them suffered repression. They also knew that, “If we can keep the pressure on, and we can keep more people participating, and if we publicize these outrageous injustices, ultimately we have a good chance of succeeding.” And in this case, they were correct. The key thing that’s interesting about the Philippines case is that, as I said, there were so many unsuccessful armed uprisings previously that didn’t at all degrade Marcos’ capacity to rule. If anything, they helped him to maintain a more cohesive and loyal military because they had caused a threat. So the fact that people power won is a pretty great demonstration of the effectiveness of nonviolent resistance. Spirit: If all these past armed insurgencies didn’t win in the Philippines, why was there such a high degree of participation in the movement and how did they win when previous insurgencies hadn’t? Chenoweth: I think that the movement was able to mobilize around a shared common grievance, which was just the illegitimacy of Marcos’ rule and the fact that he assassinated an opposition leader that was a real threat to his staying power and it was outrageous. It felt, to the people, like their future had been stolen by a thief and a criminal. And so many people from enough different backgrounds felt that way to actually start to apply the leverage that they had in their society to try to effect change. The beauty about nonviolent resistance is that everybody has some leverage in society because everybody’s playing a role. Everybody’s got relationships and it’s just about kind of starting to put some pressure on those existing relationships and that’s what makes the change. Spirit: The movement in the Philippines reminds me in two ways of the U.S. civil rights movement. One is the high degree of communal resolve, so that virtually everybody took part in the Montgomery bus boycott and everybody found ways to support it. The second way it reminds me of the Philippines is that people in the Black community had a shared moral sense that the injustices were unacceptable, and they were willing to courageously sacrifice a lot to make a better day possible. Whenever I see a movement falter, I look at how the civil rights movement had so many people who believed heart and soul in it and would not give up. Maybe that’s one key reason nonviolent movements succeed — when they inspire such a high degree of commitment. Chenoweth: Yes, that’s right, and a necessary condition for this high level of participation usually is that people care enough to participate, right? So that usually means that the object around which they are mobilizing is something that has wide resonance. So, almost everybody in Egypt knew somebody who had found himself or herself in Mubarak’s prisons being treated absolutely horribly and against all the standards of human rights that the rest of society was trying to apply. So they hit the streets. That radicalized more Egyptians and, as soon as that started and it looked like the movement was gaining steam, people simply decided they weren’t going to be afraid anymore. It was like the “Emperor Has No Clothes.” It’s like there is no going back. Doug McAdam, a sociologist at Stanford, calls it cognitive liberation, which he said also happened in the civil rights movement. People just decide we’re going to do this and we don’t care what the regime does. Spirit: I love that analysis of how the people of Egypt decided they weren’t going to be afraid anymore. So, are there any last lessons you’ve learned that you think might help illuminate the road ahead for social-change movements? Chenoweth: Peter Ackerman, who is sort of an intellectual mentor of mine, says that there are three things that every nonviolent movement needs to succeed. The first is unity, the second is strategic planning, and the third is nonviolent discipline. I would say that there are things like timing that you can’t control, and there are things like the government reaction to you and the way people hear your message. You can’t really control those things, but you can control your unity, your planning and your nonviolent discipline. So any movement that wants to succeed needs to seriously consider how they can implement those three principles into their strategy.